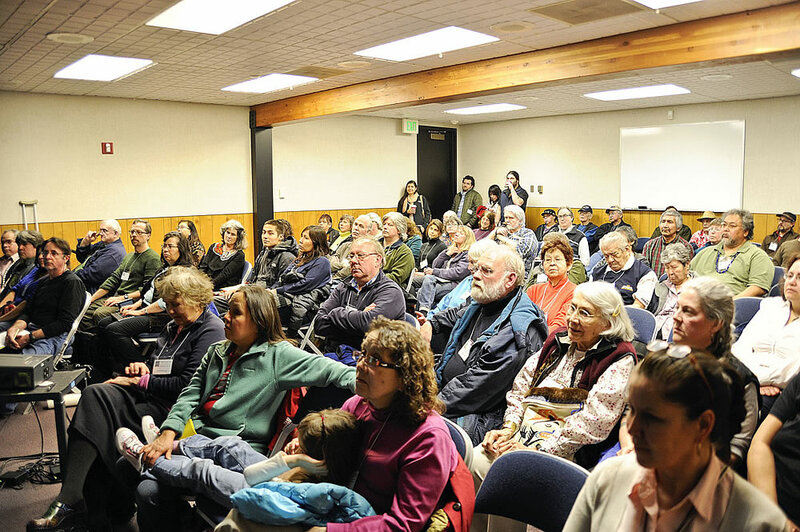 The photo above is one of three concurrent workshops during the 2012 conference in Sitka. Typically, each day begins with a plenary session in the morning followed by two sets of three workshops (1.5 hours each) each afternoon. Often, several people present at each workshop. In all, a four-day conference will host more than 20 workshops featuring as many as 90 presenters. Cultural activities, site visits, and other presentations are held during the evenings and, like the weavers’ gathering and Native arts sale, are held during the days of the conference. The Sharing Our Knowledge conferences began in 1993 and continued in roughly two-year increments until the late 1990s. The conference was reprised in 2007. See links below for conference-specific information.